According to analysis presented at Ebiquity Blog Madrid is the 10th city in the list of cities according to Twitter usage. This is confirmed by Twittermaps, showing a high number of Twitter users in Madrid. 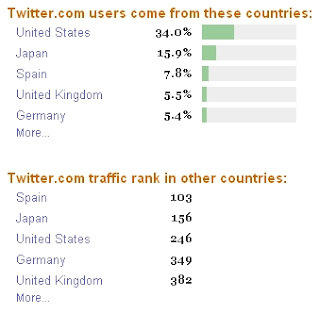 According to Alexa 7,8% of the worldwide traffic to Twitter.com comes from Spain. Again according to Alexa, Twitter.com is the 103rd most popular site in Spain. These facts convinced me to analyse the state of the Twitosphere in Spain, as I previously did for Belgium, the Netherlands and Italy. Using the same approach as for the previous countries, I managed to find 1219 Twitter accounts from Spain. A Twitter account was considered to be held by someone from Spain if the location explicitely refers to Spain or if the Twitter user was located in Spain according to one of the Twitter mapping mashups. The actual number of Spanish Twitter users is probably higher as only a litle bit more than half of the Twitter users specify their location in their profile (see this previous post). With less inhabitants than Italy, there are more Twitter accounts in Spain. For a population of 44,7 million people, Spain has 1219 Twitter accounts, whereas Italy has a population of 58,9 million people and 706 Twitter accounts. This graph below shows the history of the Spanish Twitter accounts. The graph is based on the date of the first message posted on each of the public Spanish Twitter accounts. 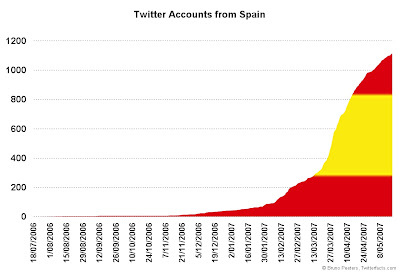 From the end of January 2007 there was an accelaration in the creation of new Twitter accounts in Spain. This growth was further accelerated around end March 2007. The graph indicates that the rate at which new Twitter accounts are created is slowing down from the end of April 2007. 103 Twitter acounts from Spain or 8,3% have chosen the keep their updates only available to their friends. This percentage has to be compared with 22% for Belgium, 9,5% for the Netherlands and 3,5% for Italy. 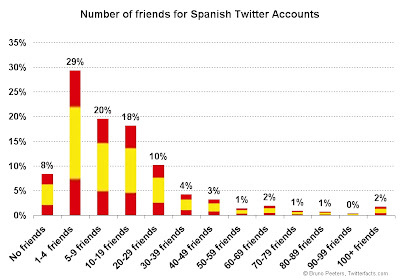 8% of the Spanish Twitter accounts have no Twitter friends at all. An average Twitter account from Spain has 15,8 friends, which is higher than the 9,6 friends for a Belgian Twitter account and 13,5 friends for a Dutch Twitter account, but lower than the 32 friends for an Italian Twitter account. Would this indicate that people in Southern Europe tend to have more friends ? A follower is someone who has indicated another Twitter account as friend and receives all updates of that other Twitter account. 6% of the accounts have no Twitter followers at all, meaning that no one else on Twitter has indicated this account as a friend. 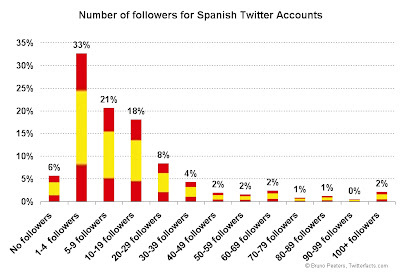 An average Twitter account from Spain has 16,9 followers. For a Belgian Twitter account there were 10,5 followers, for a Dutch Twitter account there were 12,5 followers, for an Italian Twitter account there were 26 followers. Only 1% of the accounts from Spain are still waiting for their first update to be published. Currently an average Twitter account from Spain has 106 updates, compared to 72 for a Belgian Twitter account and 88 for a Dutch Twitter account, and 106 updates for an Italian Twitter account. Please keep in mind that these averages are only snapshots, as lots of new Twitter messages (or Tweets) are published every day. 25% of all Twitter accounts from Spain with a public feed did not post an update in the last 20 days. They can perhaps be considered as inactive accounts. For Italy this was 33%, for the Netherlands 10% and for Belgium 12%. 58% of all Twitter accounts from Spain with a public feed did post at least one message in the last 7 days, indicating that these accounts are still alive. This state of the Spanish Twitosphere is only a snapshot, meaning that the figures mentioned in this post have already changed because the Twitosphere is a very dynamic environment with several new accounts being created every day, new connections being made between accounts (friends/followers) and of course new messages being written every hour of the day. The number of Twitter accounts in Spain is the highest for the four countries analysed until now. The number of accounts is still increasing. There is indication that the growth is slowing down. 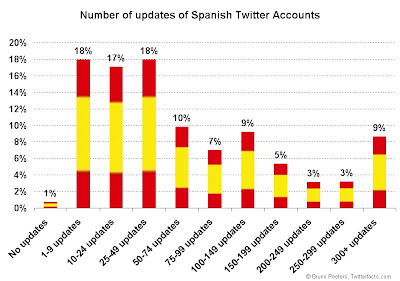 On 57% of the Spanish Twitter accounts at least one message was published in the last 7 days. This explains that there is a active Twitter community in Spain, more active than in any other European country according to Alexa. PS. Suggestions for further states of the Twitosphere (new countries) are welcome. You can leave your comment below or you send me an email at Twitterfacts at gmail dot com. I'm surprised to know that mine is the oldest Spanish Twitter account. Of all the Spanish Twitter accounts I was able to find, you published the oldest tweet. Please let me know if you someone else from Spain (with a public Twitter account) was already using Twitter before you. btw there should be someone from spain now with 20k twitter friends by now right? Increible, tres hurras por ellos.